Netflix has cooked up a very clever marketing campaign in France to celebrate the streaming service's launch. As far as ad campaigns go, this one has got to be one of the most innovative. 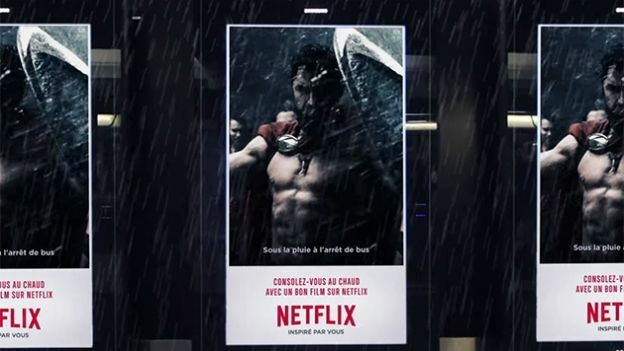 Netflix has teamed up with renowned advert agency Ogilvy Paris to roll out digital billboards around the country. All of which feature a series of flashing GIFs (those short, animated images that bombard your Twitter feed) pulled out of popular TV shows and films from the Netflix library. But here comes the clever part – the GIFs react to different things, changing their emotions based on things like current events and even the weather. For example, if there's bad weather outside the billboards may flash a GIF of Kind Leonidas (from Zack Snyder's 300) shielding himself from the rain. The GIFs also feature fan favourites from other famous programmes such as Orange is the New Black, Breaking Bad and Fargo. The ads will run through Christmas in France, but there's no doubt we would love to see them dotted around the UK. Check out the video below to see some other cool examples.